The All-Veg Site-Blog page is an easy way to stay update on our latest posts and to see what's been added to the site since you last visited! You never have to miss a great recipe or an informative article again. Harira (Moroccan Lentil Stew)-Sweet, savory. 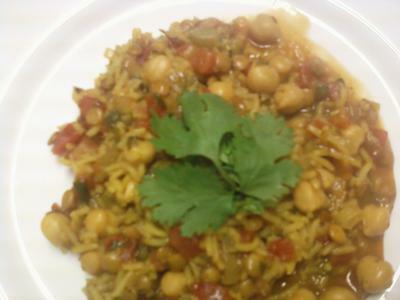 spicy - lots of words to describe this great Moroccan dish! Delicious is another! Continue reading "Harira (Moroccan Lentil Stew)"
Vegetarian Christmas Dinner Suggestions - What's on YOUR Vegetarian Christmas Dinner menu? Inquiring minds want to know! Continue reading "Vegetarian Christmas Dinner Suggestions"
Christmas Broccoli Rice Casserole-The cold weather has arrived (for some of you it's here in full force!). 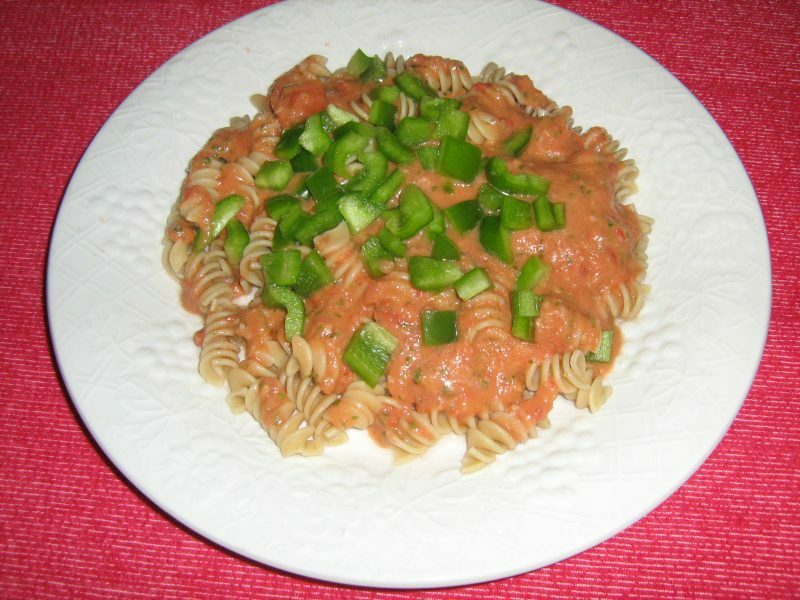 Here is a wonderful dish to take the chill off. Continue reading "Christmas Broccoli Rice Casserole"
Apple Blueberry Coffee Cake- A tasty treat rich with blueberries and apples topped with a "buttery" brown sugar and cinnamon topping. Great with a hot cup o' joe! And it's vegan too! 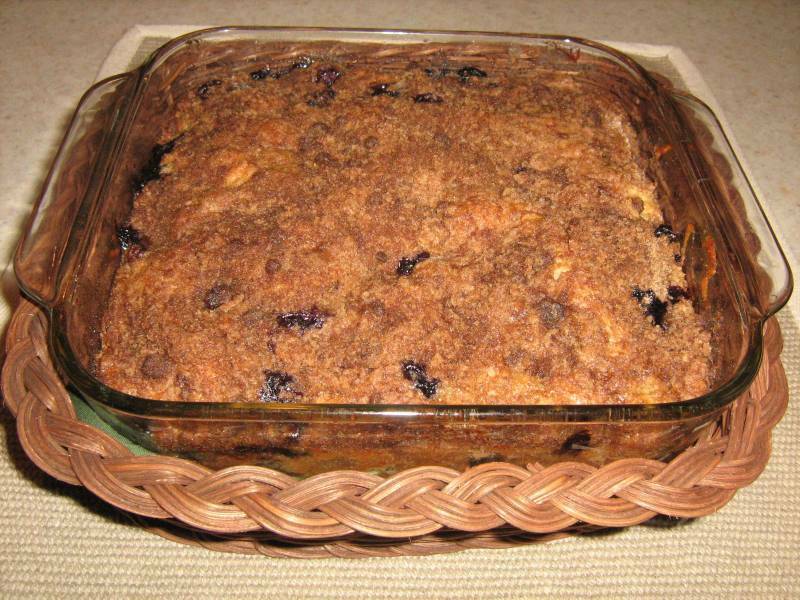 Continue reading "Apple Blueberry Coffee Cake"
Continue reading "Queen Elizabeth Cake"
Vegetarian Thanksgiving Dinner Suggestions - Here are some of our best, tried and true recipes for the holiday! Continue reading "Vegetarian Thanksgiving Dinner Suggestions"
Squash and Pear Soup-This delicious soup is a wonderful blend of sweet and savory. It makes an excellent holiday dish! 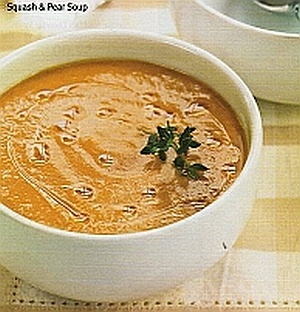 Continue reading "Squash and Pear Soup"
Pumpkins really aren't just for Halloween. They are delicious in so many other ways. This article will help! 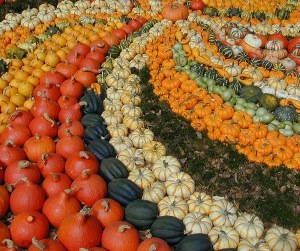 Continue reading "Pumpkins are not just for Halloween"
Beans Tuscany Improv-Quick and easy to make - use it as a main course or side dish. 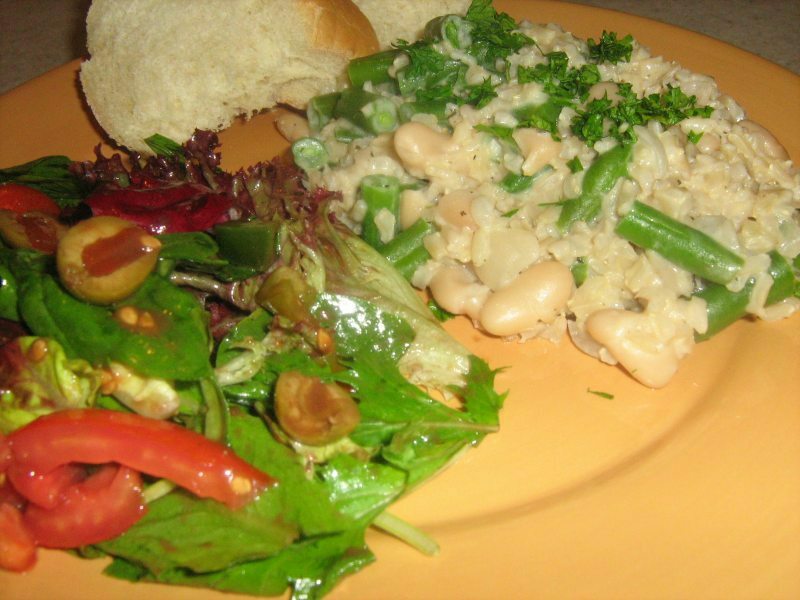 Continue reading "Beans Tuscany - an improvisational dish"
White Bean Soup with Spinach, leeks and couscous - rich in fiber and iron. 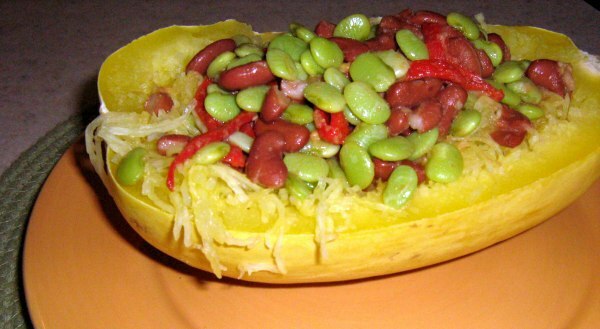 Continue reading "My White Bean Soup with spinach, leeks and couscous"
Spaghetti Squash with Balsamic Beans-Some recipes call for cooking squash an hour or more. This is a quick-cook (20 min. 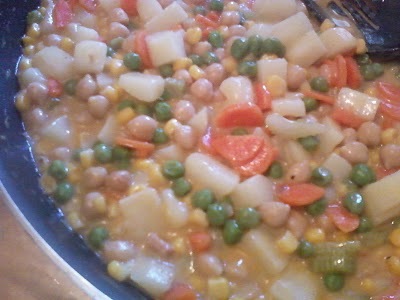 ), delicious recipe! Continue reading "Spaghetti Squash with Balsamic Beans"
Limas and Salsa on Naan-Use up those leftovers and throw together something totally different. Get creative - we did. 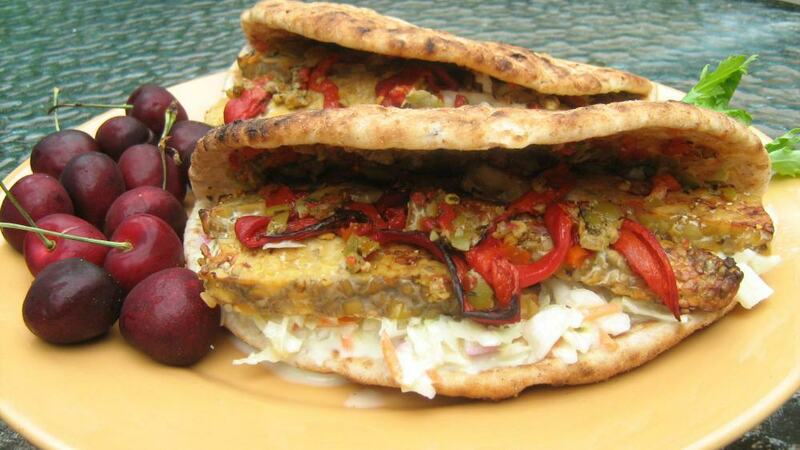 This recipe used some leftovers and produced a great meatless meal. 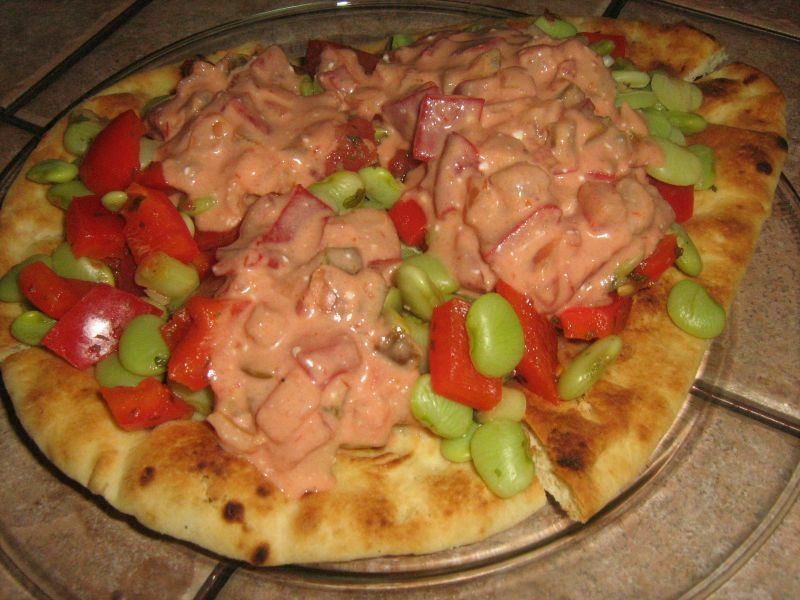 Continue reading "Limas and Salsa on Naan"
Apple-Seitan Stir Fry over Soba Noodles-A fruity, spicy, "meaty" meatless meal! This recipe has the perfect melding of flavor and texture. It's low fat and hearty too. 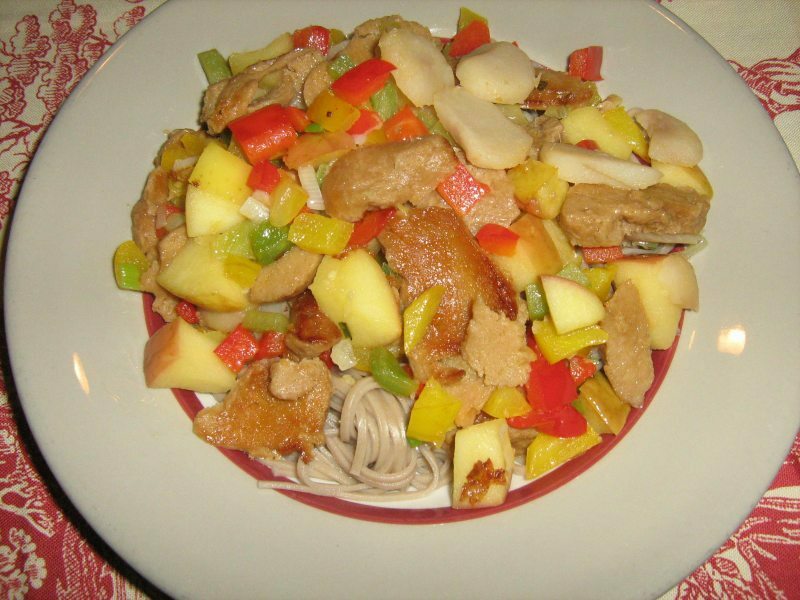 Continue reading "Apple-Seitan Stir Fry over Soba Noodles"
Pumpkin Pie Powerhouse Smoothie - A powerhouse drink loaded with folate, iron, antioxidants, phytonutrients, soy protein, fiber and Omega 3s. And it tastes great! What could be better? 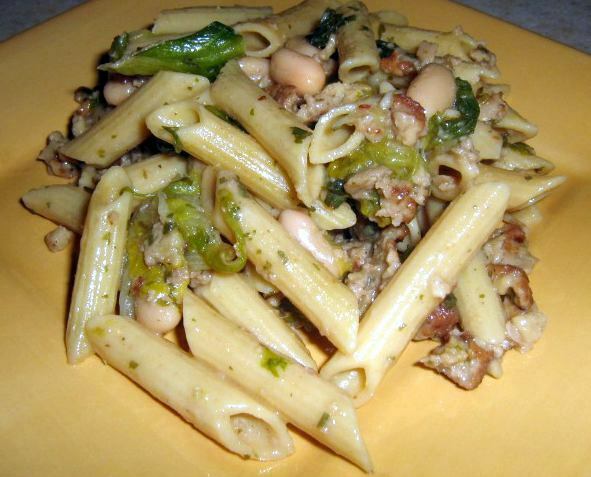 Continue reading "Pumpkin Pie Powerhouse Smoothie"
Pasta with sausage, escarole and beans-This is a delicious vegetarian recipe...a great way to give your family a great meal on a Meatless Monday! 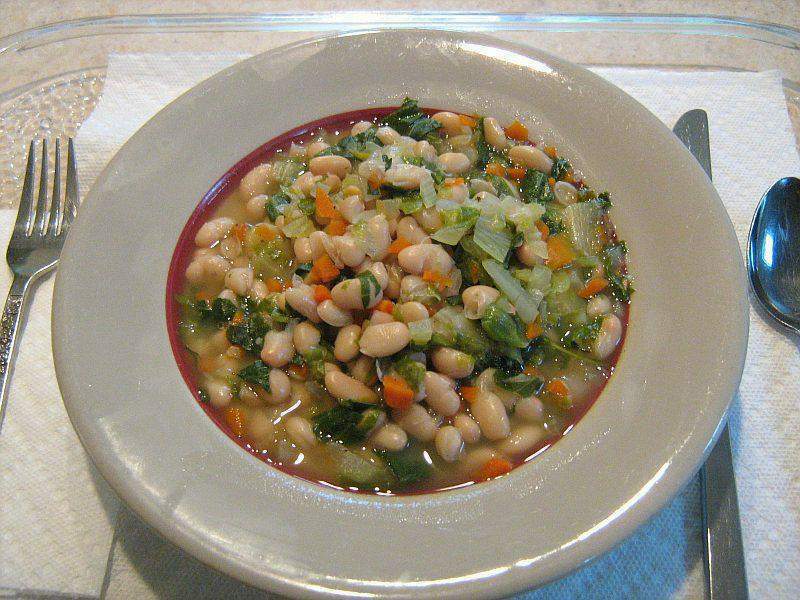 Continue reading "Pasta with sausage, escarole and beans"
Chickenless Chicken Style Vegetarian Stew-A classic made vegetarian without losing any of the delicious flavor or heartiness of the original dish. 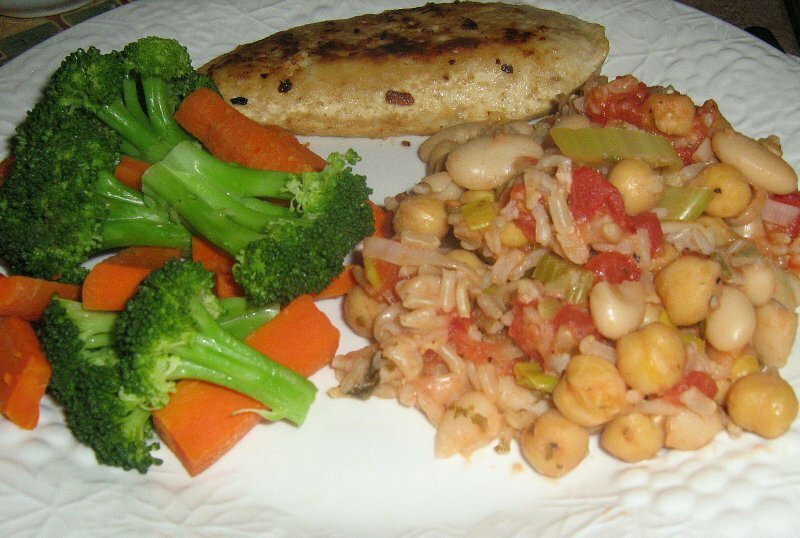 Continue reading "Chickenless Chicken Style Vegetarian Stew"
Italian Style Rice and Beans - Make this dish vegan with some easy substitutions, or lacto-ovo vegetarian with the original recipe. Either way it's great! Continue reading "Italian Style Rice and Beans"
No-Cook Tomato Sauce - This homemade tomato sauce is just perfect for a day when it's too hot to cook and you don't want sauce from a jar. Use fresh tomatoes..."
Continue reading "No-Cook Tomato Sauce"
Tempeh Tantrum - This sandwich is a lot of work but worth it. Absolutely delicious! 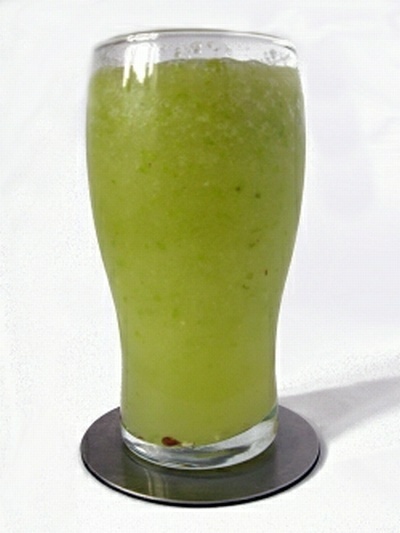 Lemon Zucchini and Summer Squash - Here's a zesty, summery way to serve up fresh zucchini and yellow summer squash. Light and Delish! 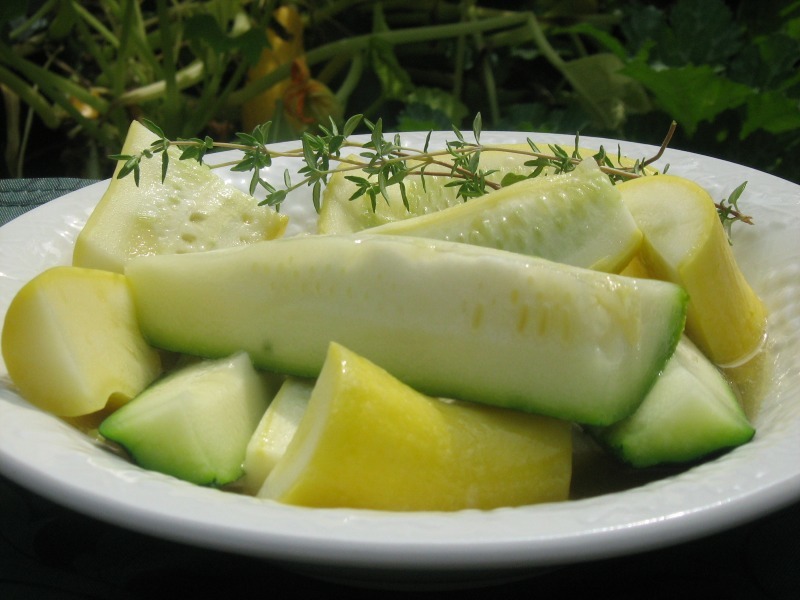 Continue reading "Lemon Zucchini and Summer Squash"